2D sensor arrays with integrated eddy current electronics plugged to a notebook via USB. Power supply directly from USB. Auf dem Testkörper zeigt das ebene 2D-Array die Wanddickenreduktionen quantifizierbar an. Hidden pores below the surface. Idea: The array is moved between two images by 1/6 of the probe spacing. All images are superimposed so that the gaps between the probes are filled. Reference: engraved Al sheet (see 1D-Arrrays). 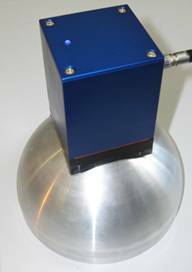 2D sensor array on an aluminium hemisphere. The sequence was derived from a reference piece with hidden flat bottom holes.